In this highly original account, renowned urban sociologists AbdouMaliq Simone and Edgar Pieterse offer a call for action based fundamentally on the detail of people's lives. Urban regions are replete with residents who are compelled to come up with innovative ways to maintain or extend livelihoods, whose makeshift character is rarely institutionalized into a fixed set of practices, locales or organizational forms. This novel analytical approach reveals a more complex relationship between people, the state and other agents than has previously been understood. As the authors argue, we need adequate concepts and practices to grasp the composition and intricacy of these shifting efforts to make visible new political possibilities for action and social justice in cities across Asia and Africa. AbdouMaliq Simone is Professor of Sociology and Urbanism at Goldsmiths, University of London. Edgar Pieterse is South African Research Chair in Urban Policy at the University of Cape Town. "Ceaselessly inventive and frequently provocative, New Urban Worlds anticipates new models, methods and modes of urbanism. 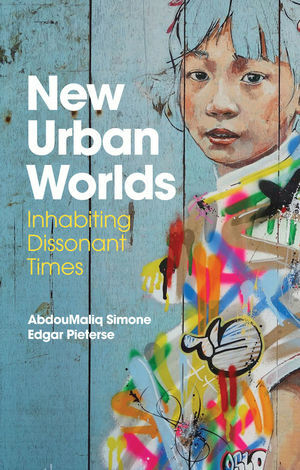 Paying attention to the details, AbdouMaliq Simone and Edgar Pieterse recount a multiplicity of urban stories from Asia and Africa - stories of political possibility and experimental potential - with a keen-eyed and always creative purpose." "Deeply conceptual and creatively pragmatic, this is a core text from two of the most significant voices in urban studies today. They offer a highly original retheorization of the urban and open up distinctive new horizons for scholars everywhere seeking to catch the dynamic, varied meanings and effects of the urban." "The vision of urban life that emerges here is messy, pluralistic, paradoxical and - perhaps above all - serendipitous. Simone and Pieterse call on researchers to be as experimental and eclectic in our scholarship as urban inhabitants are in their everyday lives; borrowing ideas and resources from different domains, and re-assembling them in ways that shed new light on pressing issues."